Choosing a silk tie is a matter of personal preference, current styles and matching the rest of your business attire. 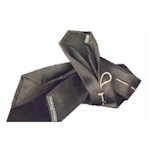 In addition, there are differences in tie construction and quality that should be considered. Shown above (left to right), Jos Banks silk print ties, a Jos Banks silk woven jacquard tie, a Sengni & Disengni 6-fold tie. Woven Jacquard - the design is woven together into the tie material. This means that for each color in the tie pattern a different colored thread is used. This approach typically results in thicker tie material. Printed - the design is printed onto the silk fabric. This approach allows for more flexibility in design (can do colors in gradations) and can allow for a thinner tie material. One fabric type is not superior to the other. There are simply two approaches that result in different types of ties. Fabric - 95% of silk is made in China and Korea. Even most handmade ties from Italy use Chinese fabric or yarn. But quality can vary across silks. One way to gauge quality is to look at warp and weft (the number of threads per cm vertically and horizontally). A high quality fabric will be thin but not too thin. A fabric with 112 yarns / cm in warp and 80/90 in weft is considered high quality. To determine the fabric quality you can look at the tightness of the weave and run your fingers across the fabric to sense its texture. Tie Shape - Ties vary in the size of the knots, their lengths, widths and shapes. Many high-end ties follow European trends with larger knots than American ties. The standard width is 3 1/4in, however ties range from 2 ¾ to 3 1/2 inch. And lengths typically range from 52 to 58 inches. However, longer ties are available through specialty stores or can be custom made. Backing Material - On lower end ties, the back of the ties is lined with a thin silk or polyester fabric. 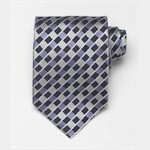 Higher quality ties will use a high quality silk or even the same material as used on the front of the tie. Inner Lining Material - This is the material sewn inside the tie. It can be cheap and flimsy, sturdy, or even overly thick. On the highest-end ties, 100% wool is used, on quality ties a wool blend is used. Note: a 6-fold or 7-fold tie is a tie construction that cuts the tie from a single piece of fabric and folds it to build in the thickness without an inner lining. This type of tie requires the highest level of skill to make successfully. Hand-Made / Machine Made - Ties differ in the way they are assembled. The least expensive ties are 100% machine made, higher end ties are machine-made and hand finished, and luxury ties are all hand made. 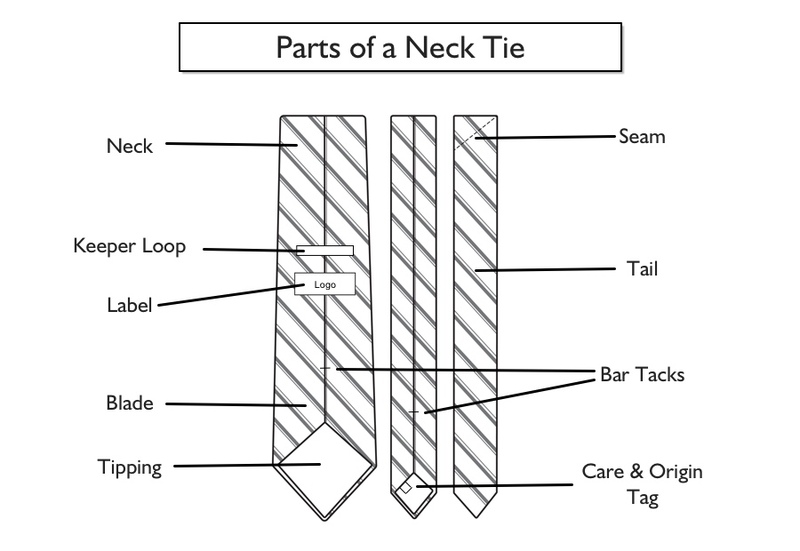 Machine made ties are typically lower quality than hand finished or hand made ties. Hold the bottom of the tie between your fingers and feel the material. The tie fabric should feel smooth. A print tie should feel thin but not flimsy, a woven jacquard tie will feel thicker, but shouldn't feel bulky. Examine the tie construction. The sewing should look sturdy. Look at where the tie was manufacturer, but don't jump to conclusions. 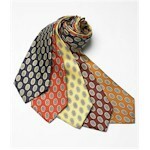 Most ties made in China are entirely handmade and can be of very good quality. Most ties made in the US are machine or machine and handmade and can be of varying qualities. Tie the tie around your neck. How is the length? How large is the tie knot? How does the tie hang? Bunching, curling or angling to a side can be signs of inferior construction.